Our 2018 Championship Show Now proudly sponsored by Ivory Coat Companion Goods. With an amazing range of Grain Free Dry Food, Gourmet Treats and All Natural Grooming Products we are very thankful for their generous support. MEGA 2018 Show Day Raffle is NOW ON SALE. As a club our goal is to promote this wonderful breed and ensure its long term welfare in Queensland. We aim to provide our members with support and advice in all aspects of the breed and promote ethical and responsible breeding practices. 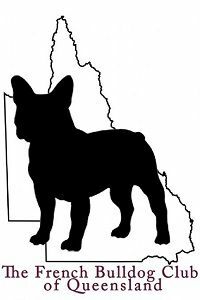 We gained affiliation in 2013 as the official French Bulldog Club of Queensland with Dogs QLD and the ANKC. Each year members and frenchie lovers are welcome to participate in family focused, frenchie friendly, social events that are held several times a year. These events, are aimed at bringing the greater breed community together with a day of fun activities for all frenchies and their owners alike. We also provide members with a quarterly newsletter. As an affiliated club, we host an annual Championship Show and Open Show - please see the "Show News and Details" tab for further information. We welcome all input from French Bulldog owners as to how you feel the club can best represent the breed, and what you as members would like to see included in our social events and newsletters. Please do not hesitate to contact the committee for more information. Buyer Beware - “Blue” French Bulldogs have again appeared in Australia. Please note that this is NOT “rare”, nor is it an allowable colour or colour pattern. The official ANKC breed standard states “... grey/blue highly undesirable”. All French Bulldogs should have black eye rims, lips and noses. This is not possible with a dilute gene (ie – blue or liver). Please also note that “blue” dogs may (due to their dilution of normal coat colours) be more prone to coat problems such as colour dilution alopecia, a condition that is genetically linked to the abnormal colour and that can result in skin problems in some breeds. Our club acknowledges that this condition has not yet been firmly established in the French Bulldog. However, the possibility remains and until proven otherwise official French Bulldog breed clubs around the world remain united in their opposition to the acceptance of dilutes of any hue. Nose pigmentation is important to protect the dog from sunburn and skin cancer, especially in QLD. The more pigment a dog has on his nose leather the better UV protection he gets. Dogs QLD has confirmed that “blue” is not a colour that can be registered on the Main Register. All highly undesirable colours must be accurately described and will only be allowed on to the Limited Register. Dogs on the Limited Register cannot be shown, nor can their offspring be officially registered – even on the Limited Register.